"Banning Travelodge, May I help you?" "I want to reserve one of your largest rooms for one night next Saturday. I will be transporting a kayak and I need to put it in the room." "All of our rooms are the same and quite large." "Will a 14 foot kayak fit in?" "I think so. Well, maybe not. What is a kayak?" "Never mind. I will just take the chance that your rooms are big enough for my kayak." 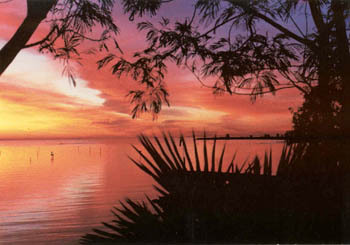 I am planning to kayak the Salton Sea which is almost 500 miles from my home in Los Altos. 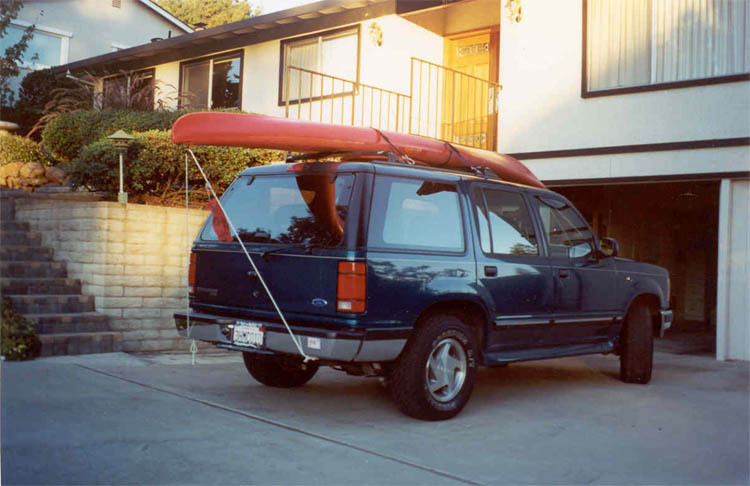 Shall I just leave the kayak on top of our car while my wife, Joy, and I overnight in some motel on the way? What if somebody stole it? That would be the end of my trip. No, I must somehow put the kayak in the room. As you can see, the trials and tribulations of a kayaker start well before he gets in the water. I personally find solo trips not much fun. After deciding on the kayak trip, my first step was to look for a companion. I know that many a trip has been ruined by incompatible partners, but I had a couple of proven partners in mind. Joy was interested, but because of a recent arm injury, she was advised by her physical therapist not to kayak. Bob and I had done several month-long trips together and he was next on my list. I was thrilled when he accepted my invitation. I selected the Salton Sea for two main reasons; it is the largest lake in California and the water is warm. The warm water reduces the risk of hypothermia which is a real danger to all but the most experienced kayakers. Another factor in favor of the Sea was that it had no cliffs along its shore. That would make getting to the shore easy in case I capsized. Approximately 35 miles long and an average of 10 miles wide, the Salton Sea has a shoreline of about 110 miles. But it is quite shallow. The average depth is 30 feet and the deepest point is just under 50 feet. It is located in a below-sea-level basin with a surface elevation of minus 228 feet. 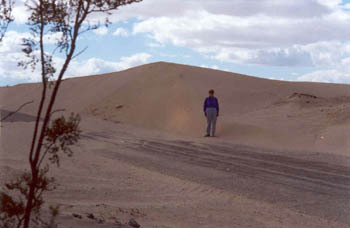 The summer temperatures routinely exceed 120°F (49°C) in this southeastern California desert. All these factors combine to keep its water warm during most of the year. In contrast, Lake Tahoe is at an elevation of 6,218 feet and is 1,640 feet deep at its deepest point. The water is cold even in summer. 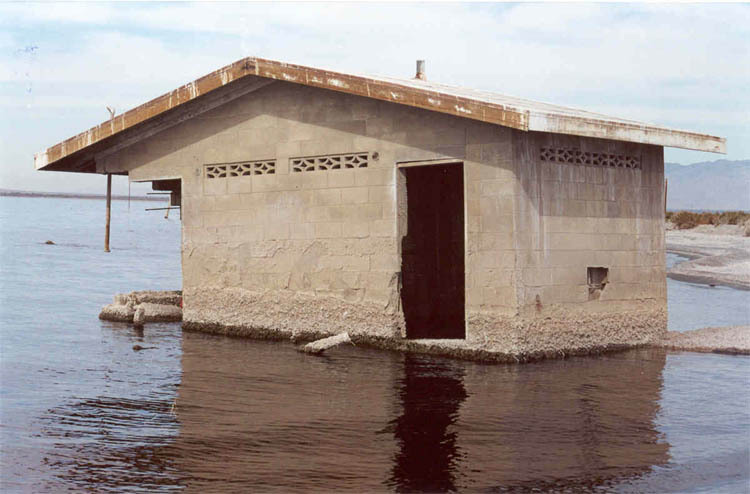 The Salton Sea did not exist 100 years ago. It was formed in 1905 as a result of human folly. In 1901, canals were dug to divert water from the Colorado River to the fields of the Imperial Valley. However, the silt from the river soon clogged the canals. A "temporary cut" in the river was breached by unseasonal floods, and for a year and a half the entire Colorado River emptied into the below-sea-level basin. There were no dams on the Colorado at that time, and the lake rose almost four feet a week during the peak flow period. When the flow was finally contained, a 450 square mile lake had been created in the middle of the desert. During the first 20 years, the lake kept shrinking. The inflow of water from the farm runoff was less than the water loss from the evaporation. 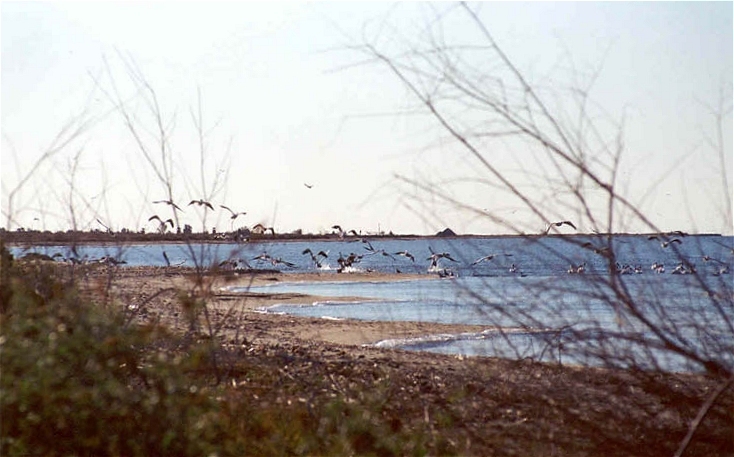 Since then, the increased runoff has stabilized the Sea at its current 350 square-mile size. The salinity of the water is, however, another story. The Colorado River water is salty and the Sea has no outlet. The water lost through evaporation leaves the salt behind. Currently, the Sea is about 25% saltier than the ocean, and unless something is done to reverse the trend, the salinity is expected to keep increasing. My goal was to kayak the entire 110-mile perimeter. If the Sea had been fresh water, Bob and I might have considered using touring kayaks, carrying all our camping gear in them and spending nights along the shore. Instead, I had to recruit Joy to assist us with vehicle support. She was to drop us off in the morning at the spot where we had stopped the day before, and then pick us up at another predetermined spot further along the route in the afternoon. Then we would drive to a campground or a motel for the night. 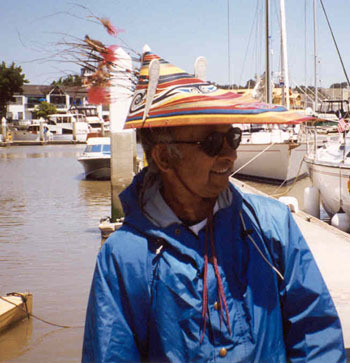 In the early seventies, I had learned about a small group running rivers in kayaks. One person had a mold and people made fiberglass kayaks using that mold. I remember buying a used kayak, a paddle, a car rack and everything else I needed to kayak for under $100. The sport was in its infancy and everything was pretty basic. In the mid-seventies, many Sierra rivers ran low due to a succession of dry years. I would frequently hit hidden rocks and damage my kayak. After it dawned on me that I was spending more time repairing the kayak than running rapids with it, I looked for another hobby. Imagine my surprise when I walked into a store to buy a kayak for this trip; state of the art KEVLAR® kayaks, whatever material KEVLAR is, cost over $3,000 and a roof rack "system" to transport the kayak went for $500. Accessories were a complete mystery to me. 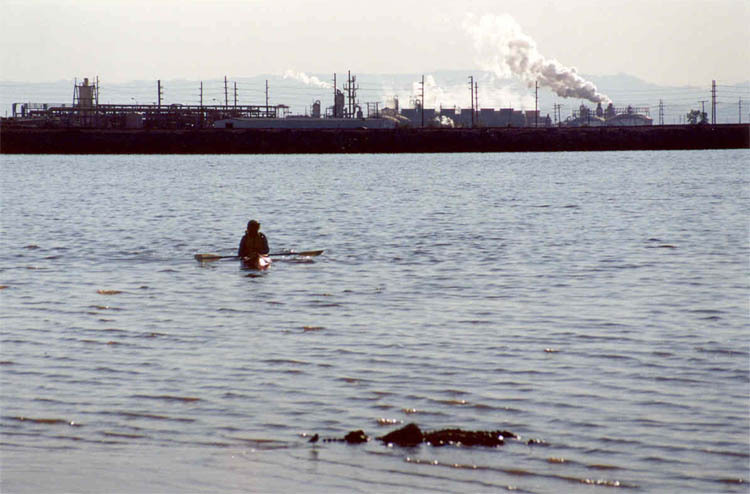 Corporate America had discovered kayaking and the money to be made in it. There were sit-in, sit-on-top and even sit-under kayaks for sale. I am joking about the last one, but there seemed to be plenty to choose from. There were touring kayaks with room for camping gear weighing 60 lbs. and up and short recreational kayaks for casual users. Alas, they did not have what I wanted; a long, narrow kayak, without cargo holds, weighing less than 45 lbs. After searching for several weeks, I felt lucky when I found one that met my specifications. And none too soon either. It was less than four months till my trip in November and I needed to get in shape. "Can you please bring the car down here?" I shout to Joy who is standing near our car at the top of the boat ramp. "Why don't you just carry the kayak up here?" "I can't. I'm too tired." That's how it was on my first practice day on a reservoir near my home. My back was aching and my arms were sore, even though I had been in the kayak less than an hour. I had covered maybe two miles. It wasn't a very encouraging experience. By the middle of October, however, I had progressed to kayaking three hours with just a few short breaks. I had learned to use my torso in addition to my arms, to propel the kayak. But even those combined muscles were just so small that I could never paddle fast enough to run out of breath. My arms would always give out first. 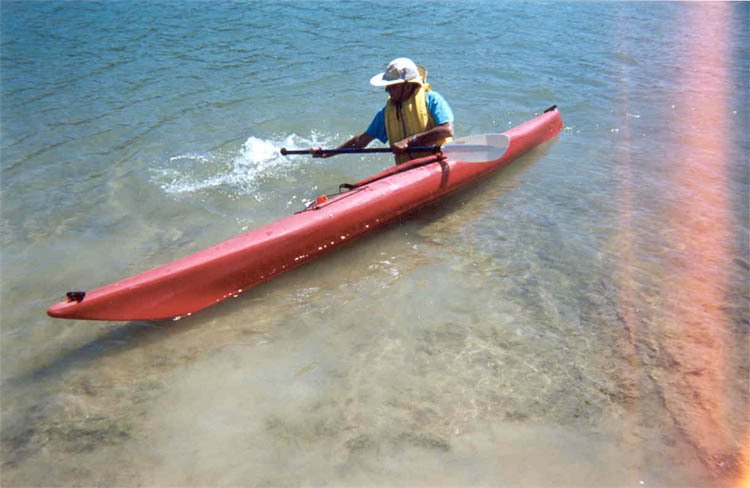 Kayaking is not an aerobic sport. "It's Bob", says Joy as she hands me the phone. "So, what did your doctor say?" "He says that I should not go. After investing all the time and money, I feel like ignoring his advice. But I think I can become a liability to you and I don't want to do that." This wasn't totally unexpected. Bob had been experiencing twitching and loss of strength in his arms. Though the doctors weren't sure, they suspected something serious. It hit me hard. 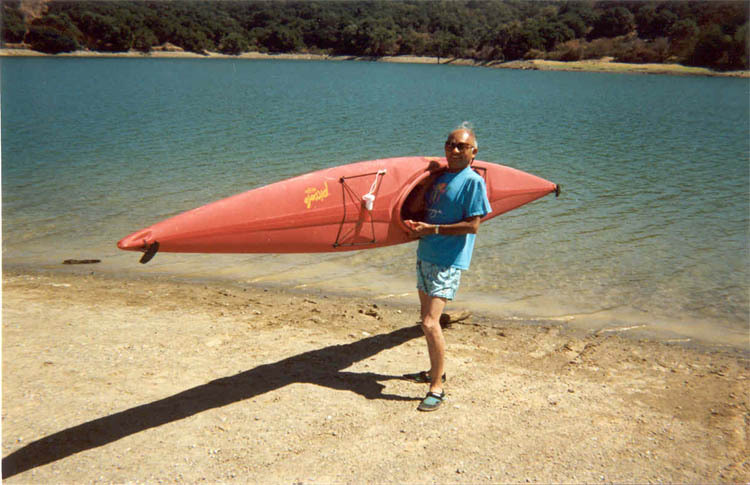 I was worried that he may have Parkinson's Disease and disappointed at the prospect of kayaking alone. It was less than three weeks before the trip and there was no time to find a new partner. 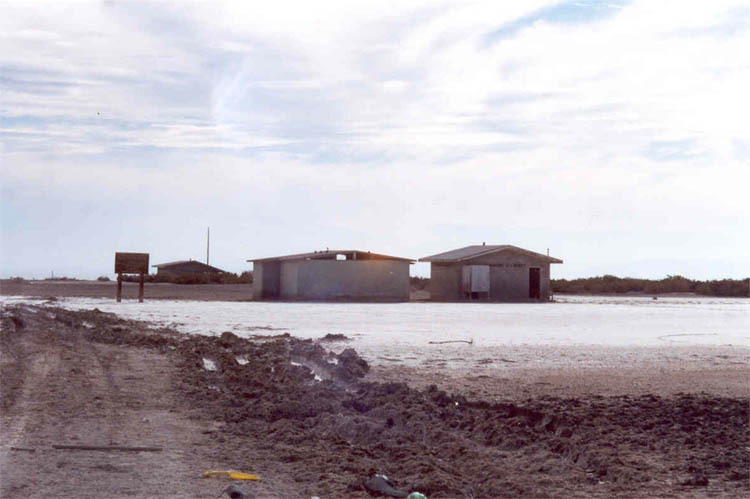 I had contacted Steve Horvitz, the Superintendent of the Salton Sea State Recreation Area, in March. He had sent me several maps and a book he had authored, Salton Sea 101. 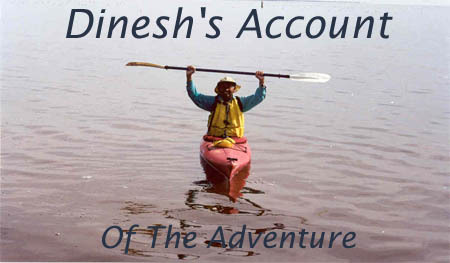 He was very enthusiastic about my planned trip and had assured me that he would help me in any way he could. He had also mentioned, that as far as he knew, nobody had kayaked the entire Salton Sea shoreline. Using that information and topo maps, I had drawn up a tentative schedule. It called for kayaking the 110 miles in eight days. I tried to keep each day's paddling distance close to a 14 mile average, but the lack of enough access roads meant that I was stuck with one really long day of 17-plus miles. One of the access roads I needed to use was a three mile dirt road on a Navy Base. Steve had told me early on that getting permission to use the road would not be a problem. Unfortunately, by the time I had firmed up my schedule with dates, the Base, which had been abandoned some time ago, was transferred to the Bureau of Land Management. Steve did not know anyone there personally, but he gave me the name of a person to contact to get permission. I did get the permission and the letter read, in part, "In response to your letter, the Bureau of Land Management has determined that the purpose and use of your planned trip to load and unload your kayak in the Salton Sea Test Base Area falls under Casual Use in the Code of Federal Regulations. In 43 CFR 2800.0-5(m), Casual Use is defined as activities that involve practices which do not ordinarily cause any appreciable disturbance or damage to the public lands, resources or improvements and, therefore, do not require a right-of-way grant or temporary use permit under this title." "Your request to load and unload your kayak on public lands administered by the Bureau of Land Management has been granted between the dates of November 10-12, 2000. Maximum stay at the Test Base for this occasion is 2 hours. If changes to this authorization need to be made, please submit your request to this office in writing for prior approval." So far so good, but more about this permission later. 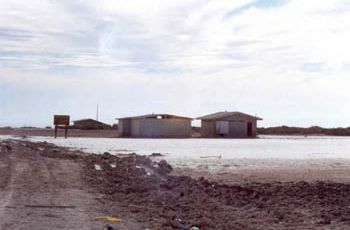 I had been to the Salton Sea a few years ago, but it was just for an hour at the State Beach. However, since Steve had answered most of my questions, I had skipped going there prior to the actual trip. My plan was to scout the access roads and camping facilities by going there a day earlier. On Saturday, November 4, Joy and I load our Ford Explorer with food and camping gear, tie the kayak on the top and head for Banning, a town just west of Palm Springs and the Gorgonio Pass. The Pass is unusually windy, as it is located between two 11,000-foot-high mountains, San Gorgonio and San Jacinto. As we approach the Pass the next morning, Joy is a little nervous as she notices the windmills in the distance whirling around. We are soon buffeted by strong winds. The kayak has moved and the front ropes are loose. I try to reassure her by telling her that unlike the tires, the straps and ropes are not made by Firestone, but she insists on pulling over. We reposition the kayak and drive the next 15 miles on the freeway at 40 mph. As we drive around the Salton Sea scouting the roads, I am pleased by the sunny skies, 70°F (21°C) temp. and the calm water. I was a little worried about the 17-plus mile kayaking day near the southern end of the Sea between Poe Road and the Red Hill Marina. We look for a road in between that could serve as a bail-out point. We find that Lack Road goes all the way to the shore and then continues further along the shore to one of UNOCAL's Geothermal power plants and that there are no gates on the road. We are finally on the road leading to Niland County Park where I start tomorrow. As we get close to the end of the road, my heart sinks. The entire area appears to be flooded. 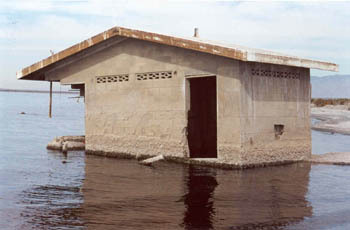 The buildings have been abandoned and there is mud and salt everywhere. We carefully turn around and I wonder if there is some other way to get to the shore. Just then, Joy spots a camper on a small hill. We find the faint dirt road that takes us there, and voila, just beyond is the shore. "Welcome to the State Park. You must be Dinesh and Joy," announces Nori, the Ranger at the entrance station. The kayak on top of our car is like a personal billboard. "We have reserved our best campsite for you and you can stay as long as you wish. Also, there will be no charge." We are pleased at this warm welcome and thank her. "And here is a message for you," continued Nori, handing me a slip of paper. NBC-TV in Palm Springs had called me a few days ago and indicated that, schedule permitting, they wanted to come and interview me. This message, however, was from one De of Dean Marine. He was wondering if two people in a canoe could join me tomorrow. I was thrilled to have some company on my first day.